The Borno State Police command has confirmed that 26 people were killed in Saturday’s suicide bomb in a mosque in Maiduguri. A witness had told Governor Kashim Shettima that 16 people died in the blast. But Aderemi Opadokun, the Borno Commissioner of Police, said there were more casualties. “A suicide bomber strapped with IED exploded himself in Alhaji Haruna Mosque at Galadima Kyari drive Ali Kotoko Road near the Monday Market,” Mr. Opadokun said. “The incident happened around 3.30 p.m., while Asar prayer was being offered at the mosque. “Twenty six people were confirmed dead while 28 were injured,” he was quoted by the News Agency of Nigeria as saying. The suicide bomber managed to beat all security checks and got to a mosque inside Maiduguri market by pretending to be a hawker. The bomber, a young man pushing a wheelbarrow loaded with some fruits, was said to have waited until Muslim traders crowded themselves in small market mosque before he moved in to detonate his suicide belt, according to witnesses. 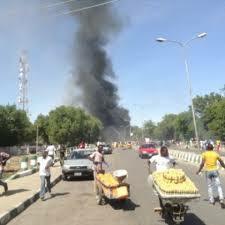 The blast resonated in most parts of Maiduguri. Mallam Ali, a trader who spoke to journalists at the market said, “The young man was pushing a wheelbarrow and when he came near the mosque, he pretended he wanted to join us in observing the late afternoon prayers. “As he parked the wheelbarrow, and went to the entrance of the already filled mosque, the bomb went off,” he said. Mr. Ali said he was lucky to have escaped because he was yet to finish his ablution before joining the prayers when the incident happened. “I was still performing my ablution when that incident happened. I had to take to my heels even though the sound of the blast had almost rendered me deaf,” he said. Governor Kashim Shettima of Borno state, arrived the scene shortly after the incident to assess the damages. Mr. Shettima condemned the act, and commiserated with the families of the victims.